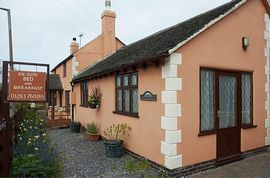 Marcia and Peter Birks offer you a warm welcome to stay at Campville Cottage in the delightful village of Netherseal in the heart of the new National Forest. 'The Gallagher Suite' is a small self contained apartment which has its own separate entrance with easy access to car parking and quite surroundings of Clifton Road. The apartment consists of a double bedroom, sitting/breakfast room and luxurious shower-room. The rooms are furnished to a high standard and include TV with Freeview and DVD player, wireless internet access, hospitality tray including biscuits and fresh fruit, a micro-wave is included for your convenience. All of our produce is locally supplied, you can just see the free range hens, who supply our fresh eggs, in the field across the lane, they accompany the Llamas who will be very interested in meeting you. These eggs can be offered to your choice perhaps with bacon, sausage, tomatoes, mushrooms, quality cereals, homemade preserves and fresh fruit juices etc. Any special requirements can be attempted. Campville Cottage is situated on the edge of the village adjacent to beautiful open countryside.